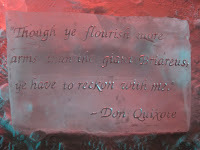 Quixote's Nightmare is an abstract ice sculpture that captures a view through the eyes of Don Quixote. 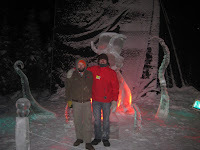 Lars Hansen and I completed it as our entry in the Single Block Classic at the 2010 World Ice Art Championships. 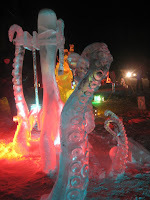 The piece was illuminated with white lights for judging the first night. We returned a couple nights later to see the sculpture under colored lights. 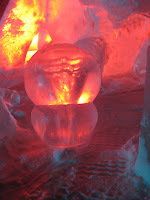 I like the colors the Ice Alaska lighting crew picked for us! Sculptors are encouraged to submit lighting design diagrams, but this year we decided to let someone else choose for us. While we were there, I stupidly tried to brush some snow off of the wheel at the front of the piece. The left eyeball came crashing down! Fortunately this happened 48 hours after judging and after the official photos were taken, and ice sculptures are temporary anyway. I still feel bad, though. Here you can see the eye resting on the ground. It is a nice piece that Lars turned on the lathe. He also sculpted the interior of the eyeball with the boiler. From the side you can see the linkage mechanism quite clearly. The piece was intended to be a working machine, a windmill whose rotor turns when the wheel on the front is turned, but the mechanism failed to function. last year's piece still stands as our most successful mechanical sculpture. Apart from the mechanical failure, we thought that this year's effort was a great success overall. Quixote's Nightmare tells a story much more than any of our previous sculptures. We had a lot of fun figuring out how to bring the story to life both artistically and mechanically. I was particularly fond of the inscription we chose. Good job Mike, it was nice to watch it come together over a few days via webcam. beautiful, and those tentacles are a real technical feat.